Light and fluffy cakes sprinkled throughout with sweet cherries and topped with glacé icing sugar and a gorgeously tempting glacé cherry. These wholesome and filling cakes take no time at all to make, and they look great served with a pot of tea in the afternoon. Today I’m going to guide you through one of my Mom’s tried and tested recipes; she’s been baking them for years and they’re one of her “go-to” recipes. Quick and easy to make, they can be ready in no time at all and they’re a guaranteed crowd pleaser. 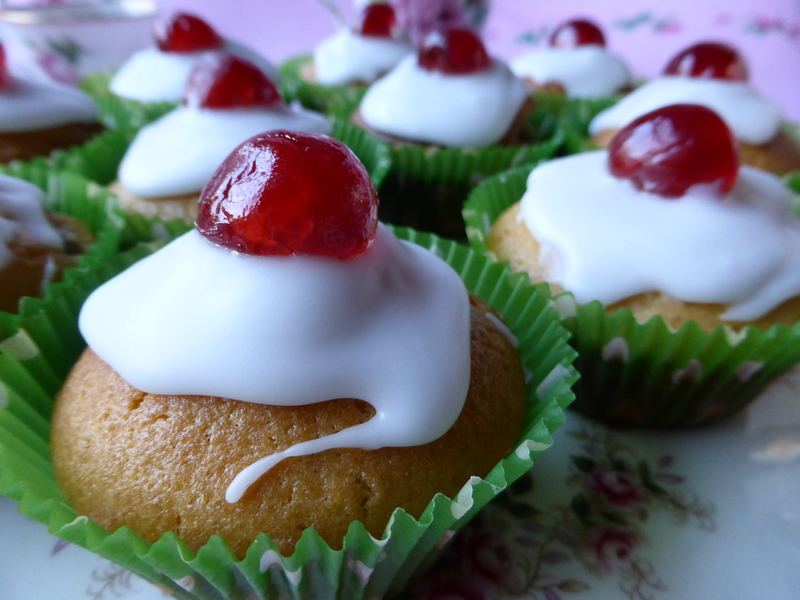 Cherry cakes are one of my favourites – they’re so easy to make, they look charming, and they always go down well when friends come round for tea. First things first, preheat the oven (I really can’t stress this enough, I forget to do this all the time). 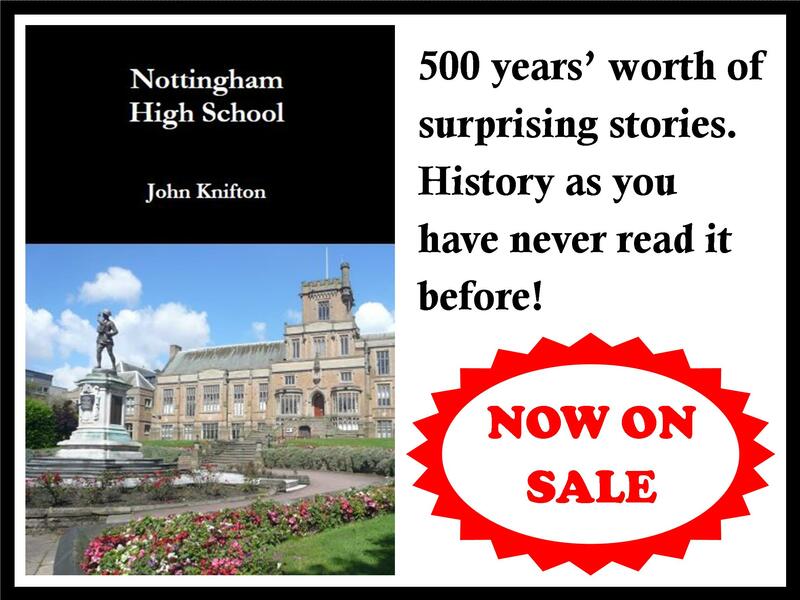 Pop it on gas mark 5 (190°C/375°F). The next thing to do is to take a good look at your glacé cherries. I bought a 7oz tub from the supermarket with a rich red colour because they’ll be the centre of attention when they decorate the tops of the cakes, and if they’re a great colour then they’ll pop against the white icing (visually). Pick six good cherries out of the tub (go for the ones at the top of the tub that aren’t too goo-ey), cut them in half and keep them to one side. Quarter the rest of the cherries and sprinkle them lightly with flour, then toss them. This will spread the flour all over the cherry quarters. It’s my Mom’s secret tip for stopping all your cherry pieces sinking to the bottom of the cakes. Trust me, it works. I tend to use a Kenwood Chef when I’m baking (but any brand of food mixer will do). These things makes life so much easier, unless you have serious arm muscles for making cakes. My Gran does, she’s been making cakes the hard way since the 1930s and her biceps are a match for any food mixer. But mine aren’t, so the Kenwood is my friend. Put 6oz of self-raising flour in the mixer. Take 3oz of salted butter (do not substitute margarine for butter, you can really taste the difference) and cut it into small cubes. This is tons easier is you leave your slab of butter out of the fridge an hour or so before you start baking. Then add the butter to the flour and mix on medium until all the butter is rubbed in to the flour. This cake recipe is a “rubbed-in” method, so it’s technically not a sponge cake, but it creates a totally delicious light and fluffy texture. While you’re waiting, get the cake cases out and put them in your baking tin. When all the fat is rubbed into the flour, add 3oz of castor sugar and give it a quick mix on medium. Then add 2 large beaten eggs and mix well. Add 4 tablespoons of milk and mix until the mixture is of a dropping consistency. To tell if it’s the right consistency, pull the mixer head out of the bowl and see if the mixture falls off. If it’s slowly falling off, then that’s a good dropping consistency. If it doesn’t fall, add a bit more milk. And if it’s running off the mixer head, don’t panic! Just add a bit of flour, mix it again, and test (repeat if necessary). Then comes the fun bit – adding the quartered cherries to the mix! Give these little beauties a quick whizz in the mixer on minimum for about 30 seconds. The trick is not to mix them for too long. If they’re pounded around the mixer like it’s a boxing ring, then they’ll get bruised and misshapen like an old boxer. 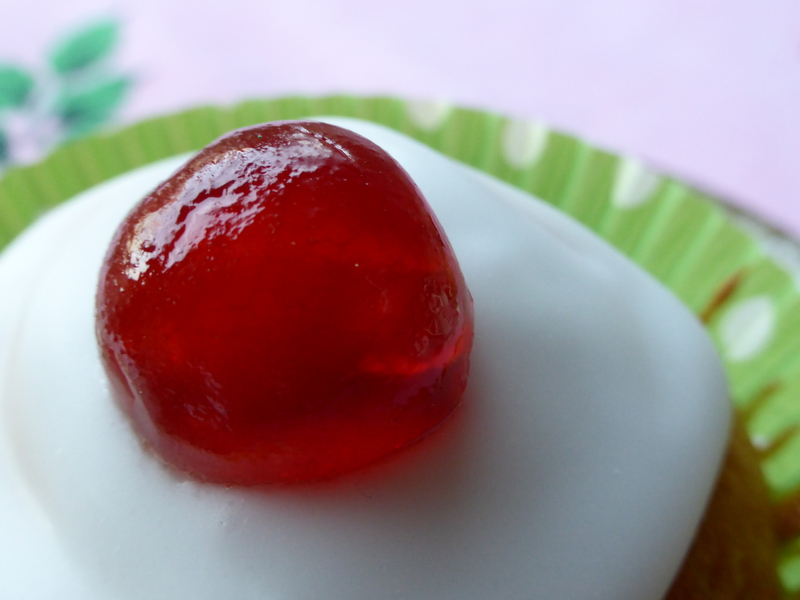 We want nicely formed, petite cherry quarters for our cakes. Spoon the mixture into your cake cases and bake on gas mark 5 for 20-25 minutes. For those of you using electric or fan ovens, gas mark 5 is 190°C or 375°F. When the cakes are done, leave them to cool on a rack and turn your attention towards the icing. The good news is that glacé icing is not terribly difficult to make… it’s basically icing sugar and water. Take 4oz of sieved icing sugar and add 4 or 5 teaspoons of water (try four first, but if it’s like mixing cement, then add another) until the icing is stiff. Don’t be tempted to add more water before you’ve mixed it all up. A little bit of water goes a long way. The great advantage of glacé icing is that it holds its shape very easily, and won’t run all over the tops of the cakes. 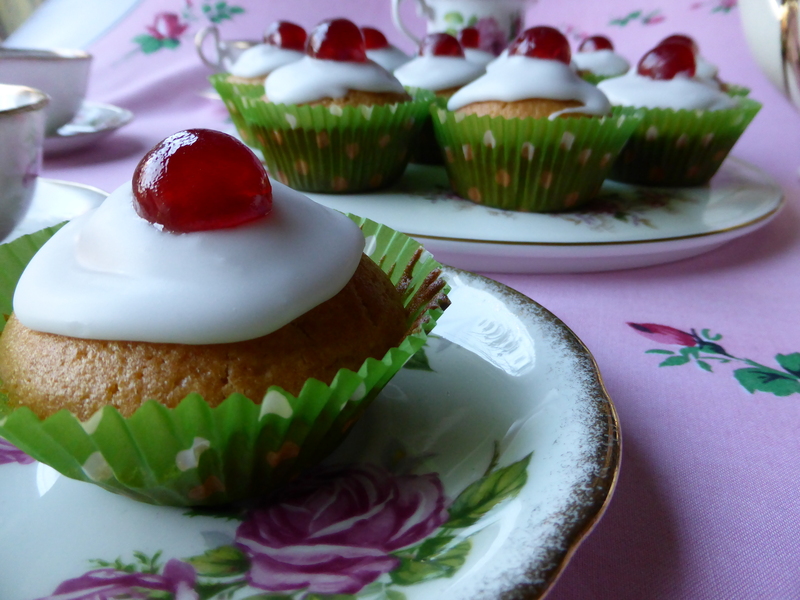 A drop of vanilla essence can be added to complement the cherry flavour, and it really gives the cakes that little extra something. Spoon the icing on to each cake, and use the back of your spoon to spread the icing into a circular shape. Then pop half a cherry on the top and you’re done! 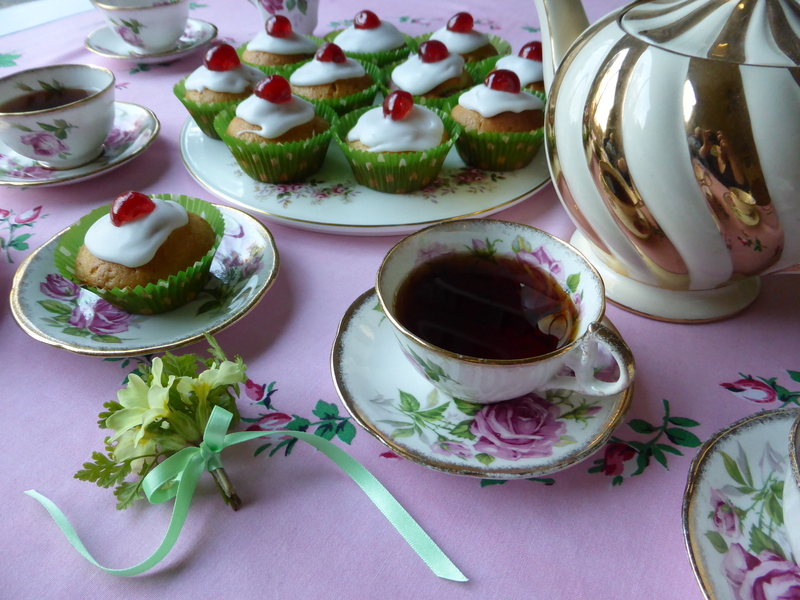 Serve with afternoon tea (check out my post on how to serve tea, English style!). A lovely recipe and some lovely cakes. Your “Mom” must be a lovely woman. That looks a fantastic recipe – might have to try that before I start Lent…And I really like your tea-set! Thanks 🙂 the cups and saucers are Edwardian, they’re called “New Orleans Rose” by Royal Standard China. The tea pot is a vintage one that I picked up in a charity shop (best find, ever! ).